How cute! Little bitty treasure! Not unusual, but today I was playing with my daughter, and she brought out her pirate treasure. It’s a small box, with metal stamped coins that are gold, silver, and copper colored. At first, I just thought it was a fun little box. Then I got to thinking. How much gold could you really get in one of those? I mean the box itself has maybe 3.5 by 6.5 x 10.5 cm of interior space in the bottom piece. Each “coin” or imitation doubloon is not round, but varies between 20-25mm in diameter, and is 2mm thick. This means it’s basically as big around as a gold Half Eagle, but basically twice as thick. A gold half-eagle has varied in dimensions and purity, but was often just shy of 8.5g of gold, which was a 22-25mm disc about 1mm thick. I did a quick calculation, and figured if the gold coins were real gold, each would be about 0.8 cubic centimeters, or about 15g each. Since the box can probably handle 120-150 gold coins, that’s about 1.8 to 2.25kg of gold. Gold recently has been something like $40-50,000 per kg. So that little box could be worth about $100,000 in coins, or if it were actually filled with a solid gold ingot, about twice that. What about in DF? Well, gold is $20,000 GURPS dollars per pound . . . or about $44,000 per kilogram. Almost exactly the same as today, so that small box of coins could be worth a small fortune. I was surprised at how portable that loot would be. You can get a sweet, sweet set of armor using the rules in Low Tech plus some house rules making plate more expensive for that (Cadmus’ kit was something like $60-65,000 if I recall, and is DR 12 on the head, neck, and torso, DR 9 everywhere else). A treasure chest might be quite small. 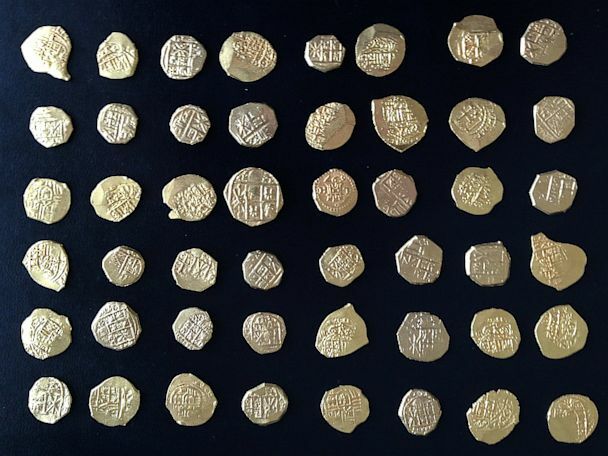 Edit: Here’s a picture of some real gold coins found off of Florida. Regrettably, scale is not provided.